I’ve written before about America’s struggle with accepting offshore wind energy development, specifically the controversy surrounding the Cape Wind project in Massachusetts. The process has been fraught with opposition since somebody first though, “Hey, could we get an offshore wind farm here in America.” As a result, it has been sitting in ‘renewable energy project limbo’ (there really should be a catchy phrase for that) for almost a decade. Maybe it’s more than a decade now. Regardless, it’s ridiculous. Yet hark, dear readers, there is a light in the darkest of times. I’ve always wanted to say that. 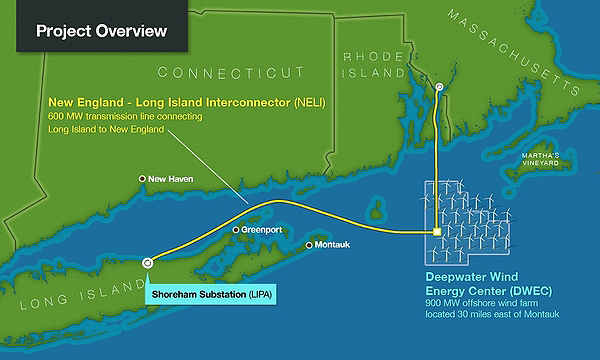 Deepwater Wind, an offshore wind project off the coast of Rhode Island has recently ‘broken ground’ (or water, if you will, although then you couldn’t really call it ‘ground-breaking’). It will have a 30 MW capacity, providing power for the entirety of Block Island, a nearby residential area, and will tentatively be completed by 2016. This is a pretty small project, consisting of only five wind turbines, so some people might consider it nothing to write home about. But, as it’s the first offshore wind farm constructed in America, you might mistake my feelings about the event for Howard Dean post-caucus shenanigans in the 2004 presidential election. The offshore wind energy potential on the coast of Rhode Island/Massachusetts was estimated to be as much as 9,000 MW, so the possibilities here are extensive. Often, the first development is the most difficult, encountering public and private opposition, legal hurdles, and inexperienced developers. Now that Deepwater Wind, has loosened the jar lid, so to speak, we might find that the obstacles are overcome more easily now. However, it’s still surprising to me, in some respects, that New England has jumped on this opportunity with such gusto while the southern Atlantic coast tries to pretend that the industry doesn’t exist. States like South Carolina, Georgia, and North Carolina have a much greater wind offshore wind resource than New England, so it’s interesting that developers have found it profitable to break ground in Rhode Island, while wind energy is still “too expensive” in North Carolina. While it is true that the southeast faces other challenges (not as much of our population lives on the coast, there are more environmental concerns, historical political leanings, et al), there are just as many if not more reasons not to develop in New England of the same caliber (developing in deep water is more expensive, Marcellus shale is a prospering commodity, greater population density on the coast who might protest). It’s also interesting to note the proximity of this development to that of Cape Wind. There is literally 50 miles between the two sites. Deepwater Wind, however, sat on the planning docket for only six years before construction started. Whether this is a result of the relative political power of the residents in each location or simple economics is an interesting question. Nevertheless, what is clear is that the future of this emerging industry will not be influenced by the environmental or engineering communities familiar with the processes, but by regulatory hurdles and the societal and political pressures of the fossil fuel industry. Tags: marine energy, ocean energy, renewable energy, rhode island, wind energy, wind power. Bookmark the permalink.